Although I have never been one to take on a dare (always been more of a play it safe kind of girl), one challenge mentioned over at Faith~Hope~&~ Love caught my attention. 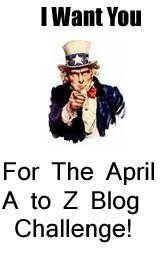 Arlee Bird at Tossing It Out has issued a challenge to fellow bloggers to blog using an A to Z theme for the month of April. So I have decided to dive in and hopefully I will not sink. Some of those letters could be pretty tricky to navigate not to mention that I don’t usually blog daily. But since it is a new year, I might as well try some new things, huh. Be sure to check out Tossing It Out for more details about the challenge. Now wish me luck as I start tomorrow, April 1st, with a post relating to the letter “A”. Thank you for being so quick to get this on your blog. I have added you to the blog roll and become a follower. I will be posting an update on my site later today acknowledging your post today. I am thrilled to have you joining us and I hope you find the challenge to be fun and rewarding. Thanks for naming my blog in your post wanda..glad to see your joining in on the fun! Can't wait to see what tomorrow brings! @Arlee and Shannon, you are welcome. This will definitely be an interesting challenge. @ Alliterative Allomorph, glad to have you join my blog and I appreciate the well wishes on the challenge. I'll definitely need it.